Nicaragua is the second-poorest country in Latin America and the Caribbean, after Haiti. In Jinotega, home to the SOPPEXCCA coffee co-operative, Nicaragua’s Health and Education census reported a level of malnutrition at nearly 39%. Because of the community’s isolation—due to the poor roads during rainy seasons, which prevent access to such basic services as health care and education—”the thin months” of seasonal hunger have hit SOPPEXCCA’s members and their families hard. Although coffee has the potential to provide enough income to cover most basic family needs, it has not been a steady source, and usually does not last the year. Most farmers own very small parcels of land, and are extremely vulnerable to relatively small changes in coffee prices or lower yields. And because Nicaragua is such a poor country, farmers can’t rely on the government for help when things get tough. SOPPEXCCA is a second-level cooperative that includes 18 first-level cooperatives and 520 member-families in Jinotega and el Cuá. On average, families farm about 5 acres of coffee, and own about 8.6 acres of land. Organizations like SOPPEXCCA are a critical resource, because they often serve as the community’s only safety net. In 2011, we began our partnership with the co-op to help this community build a long-term plan to fight seasonal hunger. After our initial planning with staff and workshops with members, the co-op established a Food Security Committee, which is overseeing SOPPEXCCA’s strategic plan and community-appropriate strategies to help address “los meses flacos” – the “Thin Months” of seasonal hunger. In 2013, we began supporting the implementation of food security strategies identified during the planning process. One of the keys to the co-op’s success will be its ability to monitor its own progress, rather than relying on NGO partners. To this end, we worked with SOPPEXCCA to develop a monitoring & evaluation system that staff is using to measure progress, identify impediments, and build on what works. “Advancing together:” communities make their own informed decisions by learning together and sharing their perspectives. 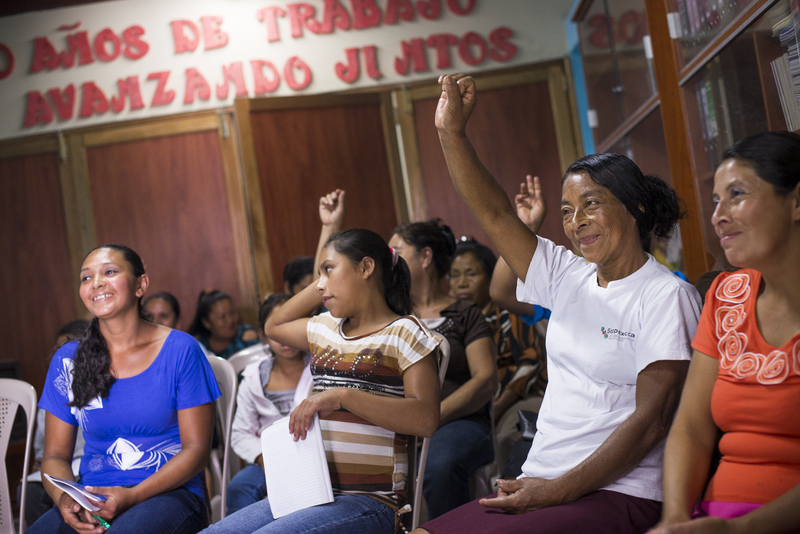 We’ve trained 200 families on the importance of healthy food and nutrition, food security, and crop management. SOPPEXCCA staff has been trained to facilitate community food security workshops. SOPPEXCCA has established a community-based Food Security Committee. SOPPEXCCA has established one ecological school garden and nutrition training for 200 elementary students. Co-op staff and a representative from the school has been trained on basic methodology, including garden management and curriculum development for the classroom. Soppexcca producers have established bean fields to feed their families; a revolving fund has been set up to keep basic grains locally sourced, accessible, and affordable. 137 families from 13 communities are growing 337 acres of beans. Maize is also being added for production. SOPPEXCCA constructed a storage facility with 300 tons of basic grains storage capacity. The building is sited in La Paz del Tuma to maximize access to members, and features 51 metal silos to ensure quality. A revolving loan fund was established to help families grow basic grains. This fund also enables the co-op to purchase and sell beans and maize with members, to keep supplies and prices consistent and affordable. Nearly 200 families have benefited from the revolving fund. More than 100 co-op members are being trained in the cultivation of at least one alternative crop. Most families have chosen to cultivate cacao and achiote. A cacao nursery was created in 2014, establishing 24,000 cacao plants (equivalent to 34.5 acres). These plants were distributed in 2015. A new organic farmers market is being developed by SOPPEXCCA that will employ 20 women members to sell organic produce to Jinotega-area residents. 200 farm plans have been completed and are being implemented to improve food security and support soil and water conservation practices. Farm plans include a diagnostic of each product with a focus on food security; and a food security plan for each family. Integrated soil and water conversation practices. 7,000 meters of hedgerows have been established on 83 farms. Bean seeds have been purchased to establish cover crops and improve soil fertility on at least 43 acres of land with soil fertility problems. A Baseline and Participatory Community Diagnostic were completed at the beginning of the project. A Monitoring & Evaluation manual was completed in June 2014. SOPPEXCCA staff have been trained on monitoring.